Hint: whenever someone says something like, “I’m not racist but…” they are absolutely about to say something racist. To be fair, I can totally understand how people would oppose such a development because it would tend to change (perhaps irrevocably) the character of a town which has had a very consistent pastoral, settler-type history since it was founded. There’s a distinct tension between preserving the status quo, and moving with the times. Suburbs do change over time – for instance, predominantly Vietnamese Cabramatta used to be predominantly Greek several decades ago – and there are both positives and negatives associated with that change. I believe there are valid arguments on both sides, but what is not a valid argument, is the one that seems to be the prevailing one among the locals. I just finished reading The New New Thing, Michael Lewis’s book tracking the life of serial billionaire tech entrepreneur Jim Clark up to 1999. Clark founded Silicon Graphics, Netscape and Healtheon, which all turned out to be billion-dollar companies (at least, at some point in their lifespan). Lewis is perhaps best known for Liar’s Poker, the investment banker’s must-read book, and of course the other interesting books and articles he has since published as a journalist (his NY Times article on catastrophe bonds was great). His easy-to-read writing style definitely comes through in The New New Thing. The book is a bit outdated as it was written before the dot com crash, but it is still an engrossing, intriguing and humourous read. It provides an insight into Clark’s unique and somewhat unpredictable personality as he interacts with engineers, venture capitalists, bankers, lawyers and sailors (yes, sailors) throughout the 90s. I think it’s a book that’s still very much relevant today. Highly recommended. 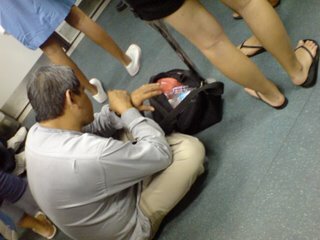 A Chinese-Singaporean blogger going under the handle of “Fragrance Prince” was travelling on the MRT one day. Sitting on the floor of the train was a hobo, who apparently was suffering a particularly noticeable case of bromhidrosis. Feeling so offended by the man’s very presence, he snapped a photo. Based on that photo, Singaporean hobos look pretty presentable actually. Later that day, the Prince returned home and vented his feelings in a blog post entitled “Weirdo In 1st World Country”. Unfortunately, the hobo turned out to be a Malay and the Prince’s rant on the hobo disintegrated instead into a racist rant aimed squarely at Malays. You can read the post here. POLICE have arrested a 24-year-old man for posting contents in his blog that could “wound the racial feelings of another”, according to their statement. Under the amendments made last September to the Penal Code, whoever, with intent to wound the religious or racial feelings of any person, causes any matter to be seen or heard by that person, shall be punished with a jail term of up to three years, or with a fine, or with both. Our racial vilification laws in NSW are quite a bit softer. It looks like making a racist blog post may only a criminal offence if it incites hatred towards, serious contempt for, or severe ridicule of, a person (or group of persons) on the ground of the race of the person, either because it threatens physical harm towards the person or their property, or incites others to cause that physical harm. And then the maximum penalty is only a fine and/or up to 6 months in the slammer. It looks like if Fragrance Prince was living in Sydney when he did that, he’d still be sitting pretty at home (though no doubt trying to fend off an online flame war). We had our annual “health and wellbeing” fair at work today. They turned the main function room into a bustling health fair of sorts and set up different stations where you can do all manner of different things. I went to the body composition station and the massage station, but they had things like reflexology, iridology, heart checks, etc. They set the massage chairs along the North wall so you get a beautiful view of the harbour as well. Very relaxing. Somewhat surprisingly, my health appears to be fine… I’ve put on about 5kgs since I started working, but it’s still well within the healthy range. They measured some obscure stats as well. Apparently my basal metabolic age is 12(! ), which is a good thing, but I’ve been warned it slows with age, making it easier to pack on the kilos. My hydration level is 63%, which is within the average range of 50-65%. This was very surprising, given my low daily intake of water. I get by on one 600ml bottle of water, then have a couple cups of water in the evening. My daily intake typically isn’t much more than a litre. Apparently my bones also weigh about 3 kilos and I have a visceral fat rating of 2. At the end of the analysis, the person talking me through my stats wrote down some suggestions for me. One of them reads: “Increase physical activity, e.g., take stairs instead of lift.” Sitting on a floor 200 metres above ground level, I still can’t tell if she was joking or not. The AUD/USD hit 0.9610 a few hours ago and is now hovering at about 0.9600. Another bid for parity maybe? One thing’s for sure – now is a great time to take a trip to the States. Malcolm Gladwell’s releasing a new book called Outliers later this year. It’s a book about the backgrounds of the highly successful. Ought to make for interesting reading… I know I’ll be picking up a copy when it comes out. Outliers is a book about success. It starts with a very simple question: what is the difference between those who do something special with their lives and everyone else? In Outliers, we’re going to visit a genius who lives on a horse farm in Northern Missouri. We’re going to examine the bizarre histories of professional hockey and soccer players, and look into the peculiar childhood of Bill Gates, and spend time in a Chinese rice paddy, and investigate the world’s greatest law firm, and wonder about what distinguishes pilots who crash planes from those who don’t. And in examining the lives of the remarkable among usthe brilliant, the exceptional and the unusualI want to convince you that the way we think about success is all wrong. The reference to “world’s greatest law firm” perked my attention. My hunch is that Gladwell has written about Wachtell. WLRK is a firm which has, on a consistent basis, the highest profitability per partner – and not by a few percent over its closest competitor (typically Cravath) but by margins in the region of 50% or so. And its associates are paid absurdly well because of it (although the rumour is that they push the equivalent of 3000 billables each year – I say “equivalent” because they tend to work on an i-bank-like contingency fee basis). More interesting is that it’s a relatively young firm. In fact, three of its name partners are still working there. It’s also a small firm – only a couple hundred attorneys. Another unique aspect is that it has a partner:associate ratio of about 1:1. After initially appearing in Wired, the tale of the MIT Blackjack Club finally makes it to the big screen. It’s a decent watch, but nothing fantastic. Ironically, Mezrich probably would have made more money from his book and selling the rights to make the movie from it than the club members made pulling their long hours at the tables. There is a scene from the movie where the character played by Kevin Spacey poses a question to our protagonist. It goes like this. You are on a game show. Before you are three closed doors. Behind one of them is a car, and behind the other two are goats. If you open the right door, you win what’s behind it (obviously, you want the car). The host, who knows what’s behind each door, gives you an opportunity to pick a door. After picking your door, the host does not open it, but instead opens another door – one which the host knows does not have the car. So now there are only two closed doors. The host then gives you a choice: you can stick with your original door, or you can switch to the other door. What do you do? If you haven’t seen the problem before, pause here and have a think. In the movie, our protagonist flips off an answer worthy of a 4.0 GPA mathematical whiz and opts to switch doors, saying that doing so will effectively double his chances of winning the car. This is extremely counter-intuitive, but it is correct. The urge is of course to say, it doesn’t matter – you now have a 50/50 shot at the car since there are two doors. This would be true if the two occasions on which you get to pick doors are independent, but they’re not. This problem is called the Monty Hall problem, after a game show host by that name. I’m not going to explain why it is the way it is (I find it easiest to explain to someone by drawing a probability tree, but Wikipedia explains it for you in several different ways). However, it is something which is conceptually difficult to explain someone purely orally. I tried doing it with my flatmate (who is studying a double engineering degree) without much headway… so I tried simulating the game show. 10 runs later, he had only “won” the car 3 times, but he was unconvinced and said the sample size was too low. He remained unconvinced until I wrote a quick computer program to run through 10,000 samples (the car was won 3,331 times). One way I like to explain it to remove the conceptual roadblock (ie, “It’s 50/50 because it’s an independent event!”) is that if it’s 50/50, then it shouldn’t matter that you choose not to switch doors when given the chance. So, if you stick with your original choice, you should have a 50/50 shot at winning. But, when you make that first choice you only have a 33% chance of winning. So why, if you stick with your first choice, would your chances of winning suddenly increase to 50% just because a door is removed? Well, the answer is, it doesn’t. Your chances of winning stay at 33%. Here’s a variation. Say you have 4 doors. You get to pick one. After you do so, the game show host reveals one door which does not have the car and then gives you the choice to stay with your original door, or swap to one of the two other closed doors. What do you do? Answer (highlight to reveal – sorry RSS readers): It will still increase your chances to swap. Not as much as in the 3-door scenario, but still enough to make a difference. If you stay with your first pick, you have a 1 in 4 chance of winning (25%). If you swap to one of the other doors (at random), I calculate your odds of winning improving to 3 in 8 (37.5%). In still other words, in attempting to take Yahoo by force, they let an amount equal to Yahoo slip through their fingers. Why isn’t anyone writing about Yahoo’s amazing stock gains and Microsoft’s plunge? Sidenote: Regarding that second post I linked… oh for the days I could leave work at 5.30pm. I actually got into work at 6.30am today. (Note to aspiring law clerks and grads: “cross-border legal work” sounds much more glamorous than it really is. Much.) And sleep deprivation causes transient bouts of erratic peculiarity. Ros. How are you coping with those private equity deals?